Rigid ankle foot orthoses increase gait speed in hemiplegic stroke patients, but not for the reasons one might think, according to research from the Kessler Foundation Research Center in New Jersey. 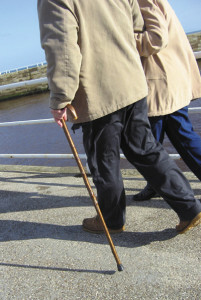 In a study of 15 patients with chronic post-stroke hemiplegia, investigators found that use of a solid AFO did significantly increase self-selected gait speed compared to without the device, from .57 m/s to .67 m/s (although not to the .8 m/s level of a fully functional ambulator). However, that increase in gait speed was not associated with improved forefoot propulsion. During the terminal double support phase of gait, AFO use did not significantly affect impulse levels in any part of the foot. Mean force during the propulsive phase increased significantly for the whole foot with AFO use, but did not change significantly in the forefoot specifically. Meanwhile, more dramatic effects were seen during the initial double support phase. Impulse significantly decreased with AFO use for the whole foot and hindfoot, while remaining unchanged in the forefoot. Mean force also significantly decreased in both the whole foot and hindfoot. And during a two minute walk, the percent change in hindfoot impulse while wearing the AFO was significantly correlated with the percent change in velocity. The findings, presented in August at the emed Scientific Meeting, suggest that the increase in gait speed associated with the AFO is related to decreased braking forces during initial double support rather than increased propulsive forces during terminal double support. The decreased braking force facilitates a more efficient weight transfer and can take the hitch out of a patient’s gait, said Karen Nolan, PhD, a research scientist at the Kessler Foundation’s Human Performance and Movement Analysis laboratory, who presented the findings. The downside, Nolan said, is that the AFO essentially inhibits third rocker function, even in patients who have retained some plantar flexor muscle strength. Hinged AFOs and functional electrical stimulation may offer ways to avoid this situation, but not all patients have the strength and stability to take advantage of such devices, Nolan noted. Researchers from Rancho Los Amigos National Rehabilitation Center in Downey, CA, have found that while all AFOs increase gait speed in hemiplegic post-stroke patients, most subjects tend to walk faster in a hinged brace than a rigid brace. A study presented at the 2002 meeting of the Gait and Clinical Movement Analysis Society reported that this difference may be related to limited knee flexion during swing phase while wearing rigid AFOs. However, the earlier work involved only subjects with a full range of passive dorsiflexion. Now new data from the same group, published in the September issue of Prosthetics & Orthotics International, suggest that the effect of a rigid AFO may be different in patients who have a plantar flexion contracture. Thirty hemiplegic subjects who were at least six months post-stroke were analyzed as they walked at a self-selected pace under four conditions: shoes only, rigid AFO, dorsi-assist/dorsi-stop AFO, and plantar stop/free dorsiflexion AFO. Patients with a plantar flexion contracture were compared to those without. In the group overall, all AFOs increased ankle dorsiflexion during swing and early stance phase compared to shoes alone, and both the plantar stop AFO and the rigid AFO restricted ankle plantar flexion and increased knee flexion during loading. The rigid AFO specifically did decrease ankle dorsiflexion during stance and knee flexion during swing, but only in those subjects who did not have a plantar flexion contracture.